In a hurry and need a caffeine fix? Grab the jar out of the cupboard and make yourself a quick coffee. Instant coffee is this largely taste inhibited, hi-speed, cheap form of a wonderful complex beverage. You add water to a powder or granules, maybe add a touch of milk and sweetener to taste and voila! Done! Instant coffee has the same taste in every cup. There is no variation in the flavour because of the bean you use or its roasting, the pressure from the tampa, the temperature and pressure of the water, the coarseness of the grind or the attention of a barista. It’s always the same and it doesn’t take much work for you once someone freeze dries a cup of coffee and conveniently packs it and stacks it on the supermarket shelf. But let’s face it, it just doesn’t taste that good. Yoga on the other hand is very different. Yoga is very individualized and takes focus, care, attention and time. Noone can fast track this for you – not even your teacher. In practicing yoga, you become the barista, working with love and awareness towards your ultimate daily coffee. There are no instant solutions or easy gratifications. Your body is the bean – roasted and prepared in a way that is truly unique to you. Your genetics, your nature and all that you ingest in your life, form a very individualized little roast that tempers and influences your practice. Every day the bean you begin with is a little different from the bean of the day before because you are ever changing. 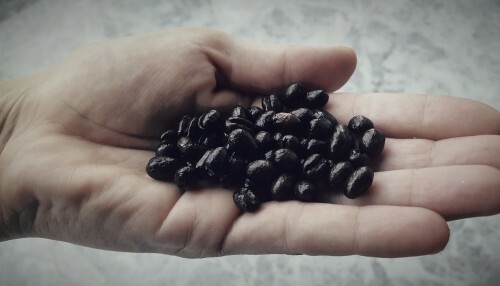 And so, every day, that wonderful coffee that you are creating varies in flavor –some days a little bitter, some days sweeter. you already are as a person and as a yogi is you being your own barista. Coffee made with love and attention is always the better coffee. Somehow we just know from the first sip when our coffee is made this way. And so instinctively we know too that our practice can lead us to be the perfect cup of coffee every day. track – yoga is the journey of a lifetime and as Pattabhi Jois said… do your practice and all is coming.